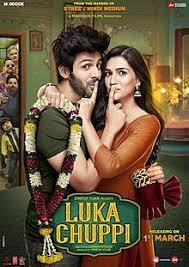 The film Luka Chuppi which is an upcoming Bollywood film of Maddock Productions. Directed by Laxman Utekar and produced by Dinesh Vijan is having a star Cast which got good audience retention in the past years. Starting from Kriti Sanon who is one of the tallest and finest actress in the bollywood when we talk about the box office collections of her films, the Heropanti debutant after several hits is now all set to show her glimpse on the screens on this 1st March in your nearest cinemas. On the other side the Lead role of male is played by Kartik Aryan Once again a supremely talented and an actor who got the love of audiences in the past year a lot. Besides these two lead actors there also exists good names like Pankaj Tripathi and Vinay Pathak. Remember Pankaj had also worked in past with Kriti Sanon in Bareilly ki barfi. The younger brother of Ayushmann Khurrana "Aparshakti Kurana" is also going to debut by this film. The trailer of Luka Chuppi Got an immense amount of popularity amongst the audience / fans and has beaten the Total Dhamaal's trailer by 2 millions views in just a week. Which shows how eagerly the audiences are waiting for the film to release. The movie is going to be released on the first Friday of the march which means that the whole weekend will be there to serve the movie. Even after the weekend till many days there seems not any big movie which can compete with Luka Chuppi, but we can not underestimate the small movies, as they are performing far better then those of having big star cast now a days. Luka Chuppi is expected to collect at least 10 Crores on his initial day of release and will be having a week end of about 25 Crore in total. The movie is going to be around 100 - 140 Crore of a life time business. (Prediction). Give us your Precious Feedback through Comments. Copyright @ 2019 | Showbiz Beat | All Rights Reserved.